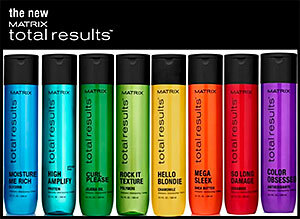 Complete selections of authentic, professional-only hair care products. A professional recommendation from a licensed cosmetologist; something you can’t get in a drug store or supermarket. A Product Performance Guarantee. If any product purchased at Kimera does not meet expectations, you can exchange it for another product, or request a refund. Moisturizing Cleanse – Enriched with Vitamins A and E to strengthen and rejuvenate hair, and natural humectants to help restore and maintain hair’s moisture balance. Daily Protein Cleanse – Frees hair of build-up without stripping its natural moisture. 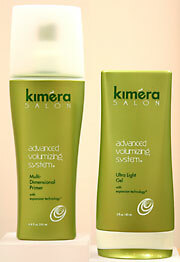 Normalizes hair and scalp pH, leaving hair fresh and full. Replenish – Formulated specially for chemically treated hair. 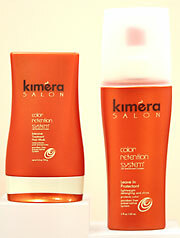 Protein and Vitamin rich formula adds moisture and strength, while increasing shine and manageability. Smoothing Shampoo – Quenches dry hair and scalp with a unique blend of Panthenol and botanical extracts that add softness, body and bounce. Botanical Rinse – Ideal for daily use. Smoothes and seals the hair’s cuticle, locking in nutrients and protein for vital for healthy hair. Fortify – Deep conditions dry, damaged hair with unique restructuring proteins to produce a healthy luster and exceptional manageability. Tri-Protein Conditioning Spray – Ideal as a detangler or leave-in conditioner. Similar to Fortify, but in a lightweight spray-in form, for all day conditioning and control. Daily Protectant – A leave-in conditioner that reduces breakage and improves shine with a blend of Wheat Protein, Panthenol, Vitamins and botanicals leaving hair soft and tangle free. Shaping Potion – Lightweight body-building styling and sculpting lotion; great for air-drying or blow-styling. Thermal Blowout Crème– Relaxes curls to create smooth waves, or straighten hair while reducing frizz and protecting hair from heat styling tools. 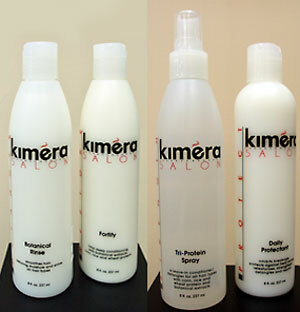 Panthenol and Vitamin enriched formula is also humidity resistant, to keep your hair shiny and smooth all day long. Texture Cream – Builds body and texture into straight styles, or can be used to define curls and waves. Molding Putty – Matte finish, creates texture, separation, and control. Max Wax Pomade – High gloss finish with iridescent mica, creates separation with soft hold. Shaping Spray – Soft Hold. Dry, workable spray won’t flake. Spray, shape, and spray some more. X-tra Shaping Spray – Medium Hold. Holds style all day long while allowing freedom of movement. With vital ingredients that help control static and resist humidity. Extreme Hold Spray – Strong Hold. Whatever style you create, this spray will keep it in place. Shine On Spray – Silkens, smoothes, and protects without added weight – for a mirror-like shine. Eliminates static and frizz. Quench Sulate Free Shampoo and Conditioner – Quench dry, thirsty, color-treated hair with a burst of moisture from this luxurious shampoo and conditioner. Strengthens, replenishes,and smoothes and seals the cuticle to lock in vibrance and shine. 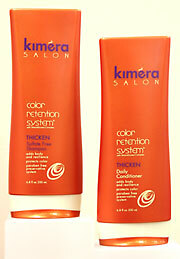 Thicken Sulfate Free Shampoo and Conditioner – Gently cleanses, while thickening fine color-treated hair. Adds body and resilience, while preserving and protecting your haircolor. Leave-In Protectant tames tangles, increases shine, and reduces drying time, while providing all day protection from oxidation and UV exposure. Intensive Treatment Mask reinforces distressed color treated hair with peptides and natural proteins. 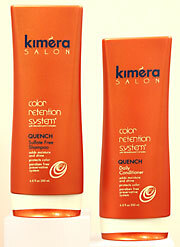 Restores strength, resilience, and shine while sealing in and preserving your haircolor. 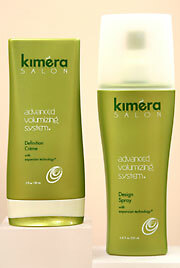 Vitalizing Shampoo gently removes residue and styling product build-up, while nourishing the hair and scalp. Thickening Conditioner uses Nanofilament technology to thicken each hair strand from the inside-out. Multidimensional Primer instantly adds volume and protects during thermal styling, with a natural feel. Design Spray and Ultra Light Gel are lightweight styling products that create voluminous styles with firm, yet touchable hold. 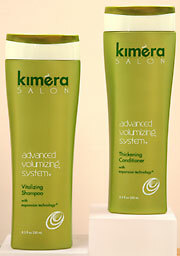 Definition Creme adds volume, retains curl, and is excellent for texturizing fine, limp hair with light, flexible hold. Do you have a shampoo (or gel or spray or mousse, etc.) that promised to be great, but turned out to be “junk”? Well, now you can bring in your unwanted or unused hair care products – any brand, from any store – and save money on a stylist recommended and salon tested product. 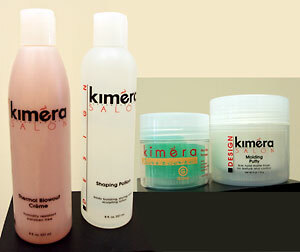 For each item you return, you’ll get $3* towards the purchase of a new product at kimera. So, it’s time to get rid of your “junk” and get some products that will help you LOVE YOUR HAIR. 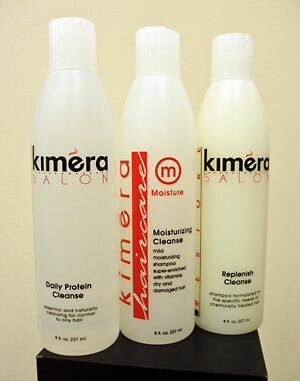 NOTE – Items purchased at kimera come with a performance guarantee. If you’re not happy with the results after a few uses – you can exchange it for another product, or request a refund. Call or stop by kimera today! *limit one offer per item purchased – not valid with other offers or specials.